Mass spectrometry imaging (MSI) was introduced more than five decades ago with secondary ion mass spectrometry (SIMS) and a decade later with laser desorption/ionization (LDI) mass spectrometry (MS). 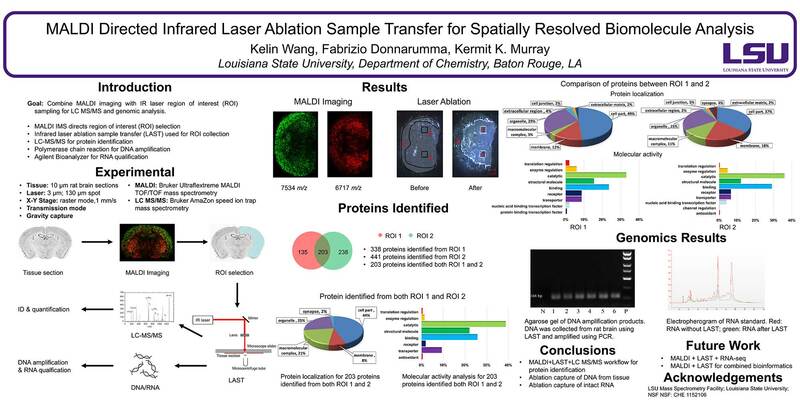 Large biomolecule imaging by matrix-assisted laser desorption/ionization (MALDI) was developed in the 1990s and ambient laser MS a decade ago. Although SIMS has been capable of imaging with a moderate mass range at sub-micrometer lateral resolution from its inception, laser MS requires additional effort to achieve a lateral resolution of 10 lm or below which is required to image at the size scale of single mammalian cells. This review covers untargeted large biomolecule MSI using lasers for desorption/ionization or laser desorption and post-ionization. 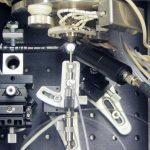 These methods include laser microprobe (LDI) MSI, MALDI MSI, laser ambient and atmospheric pressure MSI, and near-field laser ablation MS. Novel approaches to improving lateral resolution are discussed, including oversampling, beam shaping, transmission geometry, reflective and through-hole objectives, microscope mode, and near-field optics. Al Ghafly, Siraj, Das, Regmi, Magut, Galpothdeniya, Murray, Warner, Rapid Commun. Mass Spectrom. 2014, 28, 2307; DOI: 10.1002/rcm.7027. Detection of hydrophobic peptides remains a major obstacle for matrix-assisted laser desorption/ionization mass spectrometry (MALDI-MS). This stems from the fact that most matrices for MALDI are hydrophilic and therefore have low affinities for hydrophobic peptides. Herein, 1-aminopyrene (AP) and AP-derived group of uniform materials based on organic salts (GUMBOS) as novel matrices for MALDI-MS analyses of peptides were investigated for hydrophobic and hydrophilic peptides. A number of solid-phase AP-based GUMBOS are synthesized with variable hydrophobicity simply by changing the counterions. 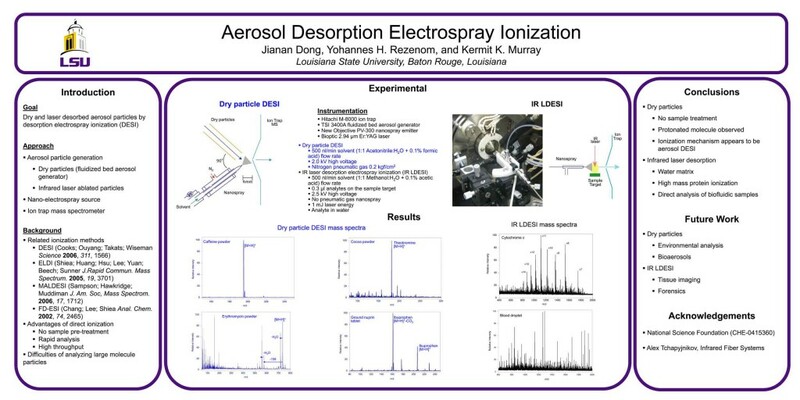 Structures were confirmed by use of 1H NMR and electrospray ionization mass spectrometry (ESI-MS). 1-Octanol/water partition coefficients (Ko/w) were used to measure the hydrophobicity of the matrices. A dried-droplet method was used for sample preparation. 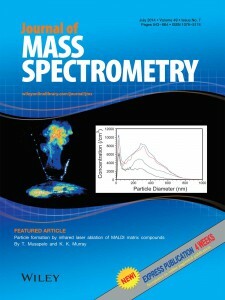 All spectra were obtained using a MALDI-TOF mass spectrometer in positive ion reflectron mode. A series of AP-based GUMBOS was synthesized including [AP][chloride] ([AP][Cl]), [AP][ascorbate] ([AP][Asc]) and [AP][bis(trifluoromethane)sulfonimide] ([AP][NTf2]). The relative hydrophobicities of these compounds and α-cyano-4-hydroxycinnamic acid (CHCA, a common MALDI matrix) indicated that AP-based GUMBOS can be tuned to be much more hydrophobic than CHCA. A clear trend is observed between the signal intensities of hydrophobic peptides and hydrophobicity of the matrix. MALDI matrices of GUMBOS with tunable hydrophobicities are easily obtained simply by varying the counterion. We have found that hydrophobic matrix materials are very effective for MALDI determination of hydrophobic peptides and, similarly, the more hydrophilic peptides displayed greater intensity in the more hydrophilic matrix. Journal of The American Society for Mass Spectrometry, April 2013: “Particle Production in Reflection and Transmission Mode Laser Ablation: Implications for Laserspray Ionization,” Thabiso Musapelo and Kermit K. Murray. 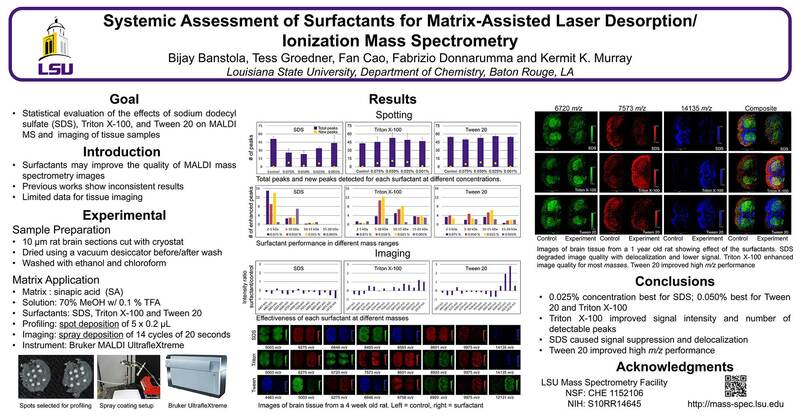 The ablated particle count and size distribution of four solid matrix materials commonly used for matrix-assisted laser desorption ionization (MALDI) were measured with a scanning mobility particle sizer (SMPS) combined with a light scattering aerodynamic particle sizer (APS). 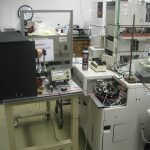 The two particle sizing instruments allowed size measurements in the range from 10 nm to 20 μm. The four solid matrixes investigated were 2,5-dihydroxybenzoic acid (DHB), 4-nitroaniline (NA), α-cyano-4-hydroxycinnamic acid (CHCA), and sinapic acid (SA). A thin film of the matrix was deposited on a stainless steel target using the dried droplet method and was irradiated with a 337 nm nitrogen laser at atmospheric pressure. The target was rotated during the measurement. A large number of nanoparticles were produced, and average particle diameters ranged from 40 to 170 nm depending on the matrix and the laser fluence. These particles are attributed to agglomeration of smaller particles and clusters and/or hydrodynamic sputtering of melted matrix. A coarse particle component of the distribution was observed with diameters between 500 nm and 2 μm. The coarse particles were significantly lower in number but had a total mass that was comparable to that of the nanoparticles. The coarse particles are attributed to matrix melting and spallation. Two of the compounds, CHCA and SA, had a third particle size distribution component in the range of 10 to 30 nm, which is attributed to the direct ejection of clusters. 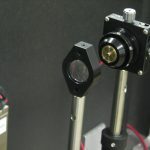 We have used an infrared laser to ablate materials under ambient conditions that were captured in solvent droplets. The droplets were either deposited on a MALDI target for off-line analysis by MALDI time-of-flight mass spectrometry or flow-injected into a nanoelectrospray source of an ion trap mass spectrometer. 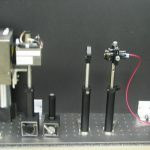 An infrared optical parametric oscillator (OPO) laser system at 2.94 μm wavelength and approximately 1 mJ pulse energy was focused onto samples for ablation at atmospheric pressure. The ablated material was captured in a solvent droplet 1–2 mm in diameter that was suspended from a silica capillary a few millimeters above the sample target. Once the sample was transferred to the droplet by ablation, the droplet was deposited on a MALDI target. A saturated matrix solution was added to the deposited sample, or in some cases, the suspended capture droplet contained the matrix. Peptide and protein standards were used to assess the effects of the number of IR laser ablation shots, sample to droplet distance, capture droplet size, droplet solvent, and laser pulse energy. 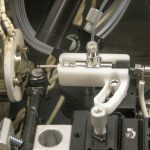 Droplet collected samples were also injected into a nanoelectrospray source of an ion trap mass spectrometer with a 500 nL injection loop. 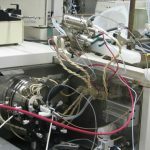 It is estimated that pmol quantities of material were transferred to the droplet with an efficiency of approximately 1%. The direct analysis of biological fluids for off-line MALDI and electrospray was demonstrated with blood, milk, and egg. The implications of this IR ablation sample transfer approach for ambient imaging are discussed.